The magnificent 18-hole par 72 golf course of the Rio Real Golf Club is situated in the heart of the city in a valley in between the Mediterranean Sea and Sierra Blanca Mountains. The golf course is a part of the Rio Real Golf Hotel which offers great accommodation and excellent facility amid an eye-catching natural beauty, spreading over a beautiful valley and crossed by the river Rio Real. 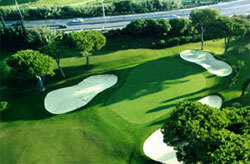 Designed by Javier Arana, the course opened for play in 1965 with wide fairways and surrounding bunkers. The layout is generally flat but there is a gradual inclination towards the sea. Over the years the course has undergone great improvements with long challenging greens with many trees. Being one of the oldest golf courses and placed at a distance of just 3 km from the Marbella city centre and about 50 km from the Malaga Airport, Rio Real Golf Club is one of the preferred golfing courses amongst the tourists. Furthermore, the 6166-meter long course offers real challenge for all, starting from amateur to all levels. Golf enthusiasts who want to play their game at different levels may find Rio Real Golf Club one of the best in Costa del Sol in a subtropical climate where temperature remains mild even during the winter, in doing so a perfect condition to play golf the year round. While 4th and 5th holes are a gaze at the seashore, the par 3 sixth hole needs more accurate tee shot in order to avoid the hillside on the right. The 8th is protected by bunkers while the 10th, 11th and par 3 12th are surrounded by lake. Furthermore, the presence of pine, palm and mimosa trees in the fairways make it quite a difficult shot for many professionals while judging the approaching distance over the ravines. 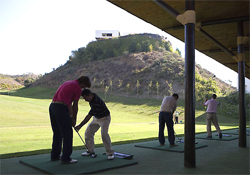 The academy of Rio Real Golf Club can really be helpful for those who want to learn a few lessons, or even for professional who are in practice of mastering any technique with the best available facilities. Golfing lessons have been outlined for individuals, ranging from 30 minutes to one hour long class. 3D Biomechanical analysis, plasma monitor and interpreter of a particular shot, including swing and putt, are also in place to single out the exact error. Rio Real Golf Club offers a wide range of facilities and services include: round the clock room service, restaurants, bars, Pro shop, Buggy hire, Hand Cart hire, driving range, medical assistance, airport transfer, corporate centre, etc. So, just take a break from your usual busy schedule to experience the grandiosity of Rio Real Golf Club and Hotel with luxurious accommodation and picturesque views amid a perfect weather.